Present you the Famous DJ in Mainstream music!David Guetta! I have no idea how the younger generation sees David Guetta but for me, David Guetta was way more awesome back then. He is then slowly get famous with his songs such as One Love and Memories. Still remember this? If you are into David Guetta you should able to know this song, One Love. Mark down 12th October 2012 on your calender because, David Guetta is coming down to town! Oh yes, he is coming this year, just before the end of the world. I have been attended quite some rave parties such as Heineken Thirst and Paul Van Dyk last year, I came to a conclusion: I am not going to work for the next rave party (which I meant it because I am going to enjoy the party as a guest from now on). I am impressed with the girls who wear high heels to rave parties because it is pretty tedious for one to stand for such a long time. Girls will be looking hot in rave parties and yes, you will get hot as well (I meant sweats). So, this is what I'm going to wear for David Guetta's party. Simple yet presentable. 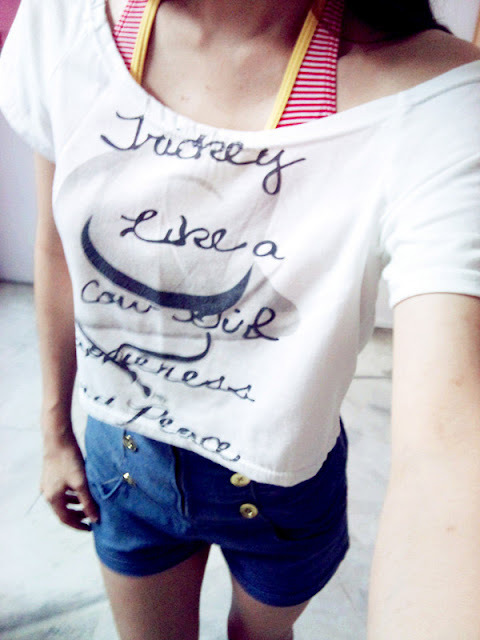 I chose to wear bikini because I have never wear the bikini before (pathetic). 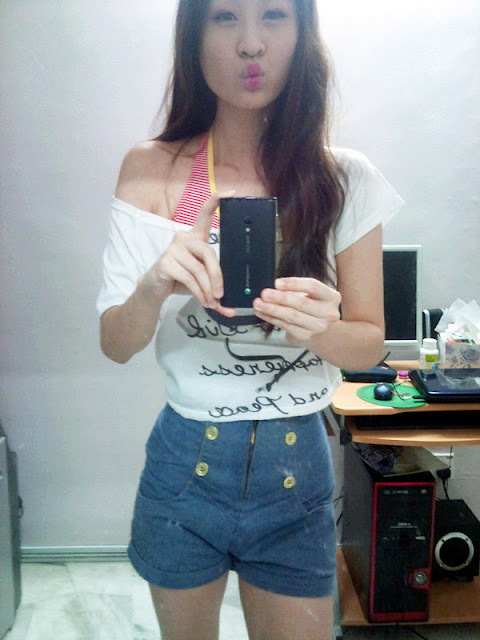 Short T is chosen to show off the tummy accidentally; high-waisted shorts to show off my long legs muahahahahaha. THIS CHIO OR NO? I purposely drew a love shape on my lips and from this picture, my lips seem to be so smaller wtf. 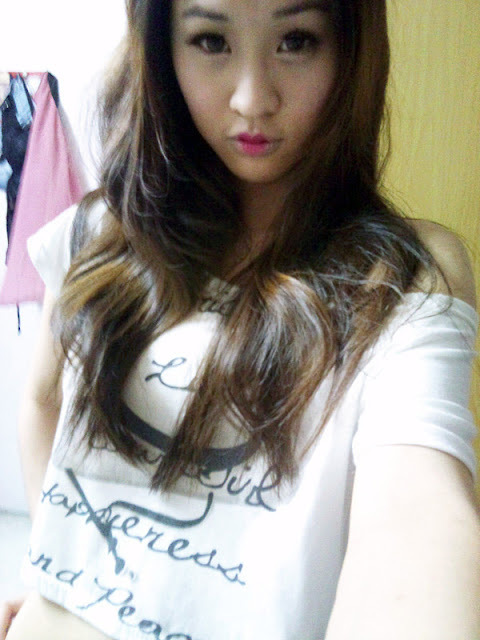 I'm pretty proud on my lousy makeup and selca skills. Now I hear you and I know what you want, FREE TICKETS! Here are the ways for you to get free tickets! Happy or no DiGi lovers? So here are the two ways you can get Free tickets. SMS DG to 2012 in order to purchase the DJ CallerTunes in the package of 10 songs (Without You, Titanium and others) at RM 1 per week. Subscribe to DiGiMusic Pluz at Rm 5 per month. The first 500 customers to download 30 MP3s will receive a free ticket. Sign up for the prepaid cash card, #DiGi Simple MAsterCard at selected DiGi Stores in the Klang Valley or during DiGi roadshows at selected local universities for IMMEDIATE redemption of 1 ticket per application, while stocks last. Existing cardholders who recommend THREE (3) friends to sign-up in a single visit will eah receive FREE tickets, while stocks last. I kinda like this song. No singing lol. You can purchase the tickets via Rock Corners or get them online via www.myticketmalaysia.com. Visit David Guetta's and Future Sound Asia Facebook pages for further information. WARAO don't look like you leh!